Who would show up for their own execution? It’s 1892, Indian Territory. A war is brewing in the Choctaw Nation as two political parties fight out issues of old and new ways. Caught in the middle is eighteen-year-old Ruth Ann, a Choctaw who doesn’t want to see her family killed. In a small but booming pre-statehood town, her mixed blood family owns a controversial newspaper, the Choctaw Tribune. Ruth Ann wants to help spread the word about critical issues but there is danger for a female reporter on all fronts—socially, politically, even physically. But what is truly worth dying for? This quest leads Ruth Ann and her brother Matthew, the stubborn editor of the fledgling Choctaw Tribune, to old Choctaw ways at the farm of a condemned murderer. It also brings them to head on clashes with leading townsmen who want their reports silenced no matter what. More killings are ahead. Who will survive to know the truth? Will truth survive? Available in print and ebook from Amazon. Click here to purchase. Someone is tearing at the fabric of the Choctaw Nation while political turmoil, assassinations, and feuds threaten the sovereignty of the tribe, which stands under the U.S. government’s scrutiny. When heated words turn to hot lead, Ruth Ann Teller—a mixed-blood Choctaw—fears losing her brother, who won’t settle for anything but the truth. Matthew is determined to use his newspaper, the Choctaw Tribune, to uncover the scheme behind Mayor Thaddeus Warren’s claim to the townsite of Dickens. Matthew is willing to risk his newspaper—and his life—to uncover a traitor among their people. But when Ruth Ann tries to help, she causes more harm than good—especially after the mayor brings in Lance Fuller, a schoolteacher from New York, to provide a rare educational opportunity for white children. How does this charming yet aloof young man fit into the mayor’s scheme? When attacks against the newspaper strike and bullets fly, a trip to the Chicago World’s Fair of 1893 is the key to saving the Choctaw Tribune and Matthew’s investigation. But Ruth Ann must find the courage to face a journey to the White City—without her brother. The Choctaw Tribune series follows the journey of a fictional mixed-blood Choctaw family as they encounter the real events and real history in Indian Territory before Oklahoma became a state. A historical fiction series with a Western flare, these Native stories explore racial, political, spiritual, and social issues in the old Choctaw Nation—and beyond. The five (or more) novels in this series will release from 2016 through 2018. The Treaty of Dancing Rabbit Creek changed everything. The Choctaw Nation could no longer remain in their ancient homelands. Young Tushpa, his family, and their small band embark on a trail of life and death. More death than life lay ahead. On their journey to a new homeland, the faith of his father and one book guide Tushpa as he learns what it means to become a man and a leader. But before long, betrayal from within and without rip at the unity of the band. Can Tushpa help keep his tattered people together? Or will they all be lost to sickness of the mind, body, and spirit on the four hundred mile walk? 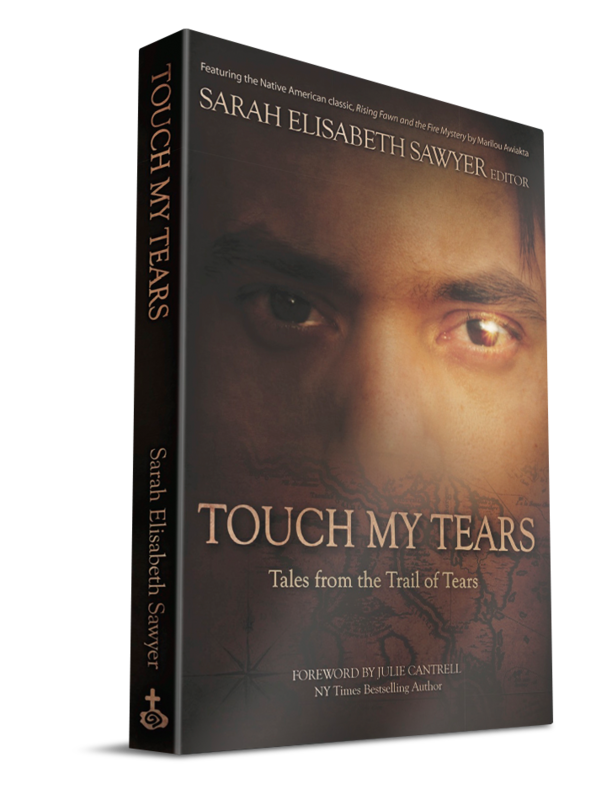 A continuation of the anthology Touch My Tears: Tales from the Trail of Tears, this story follows an original manuscript written by Tushpa’s son, James Culberson. n 1830, a treaty was signed. In 1830, hearts broke. Tears fell on the long journey for twenty thousand. The Choctaw Nation was forced to leave their homelands to preserve their people. But they could not save them all. For this collection of short stories, Choctaw authors from five U.S. states come together to present a part of their ancestors’ journey, a way to honor those who walked the trail for their future. These stories not only capture a history and a culture, but the spirit, faith, and resilience of the Choctaw people. From a little girl who begins her journey in a wood box to a man willing to die for the sake of honor, these extraordinary tales of the Choctaw Removal from their homelands delve into raw emotions and come out with the glimmer of hope necessary for the human soul. Tears of sadness. Tears of joy. Touch and experience each one. Their journeys are different. Their sufferings are unique. They all seek a reason to go on. Heart pounding, heart wrenching, heart tugging—raw and realistic. But these short stories, and many more, show a third side of the coin. With the gift to find real meaning in a story, author Sarah Elisabeth Sawyer creates tales to stir the heart and evoke deep, often buried emotions. Not one to shy away from tragedy or crisis of faith, she explores human conditions through engaging short stories.